How would you react if you hands-free would suddenly become an innovative fashion accessory? Victoria Collection, launched by Novero, comprises the complex technology of a hands-free, and all this comes within the elegance of a fashionable necklace. Like each and every thing nowadays, technology has come to adapt in the favor of fashion. When creating the innovative Victoria Collection, Novero had in mind fashion, style and functionality, and it came up with a great and wearable item through art and fashion. Obviously, technology becomes ten times more pleasant even for the most non-connoisseur individuals, once its put together to create art. The Victoria Collection was created by combining the contemporary Bluetooth hand-free with the refined shine of beautiful jewelry appropriate for any occasion. Novero presented its first collection in London, and, last month, Victoria Collection was also launched in Essen, Germany, at the design museum Red Dot. This collection brings 5 amazing models, each retailed at $120,000: Victoria Pearl, Victoria Stripes, Victoria Wave, and Victoria Lapis and a version for men that comes under the name of Victor. Each and every piece of technological jewelry is made out of precious metals and rare stones mixed together to create the perfect stylish accessory for the modern world. 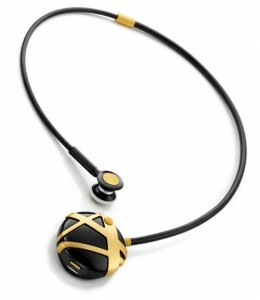 The Bluetooth necklaces come with an earpiece at one end, and with a pendant at the other. The precious stones are all meticulously applied with the pavé technique. Novero has already started thinking about its second collection, and company representatives stated that these new innovative jewels from the soon-to-come collections will be made by famous designers, and that they will comprise more types of jewelry, not only necklaces. Thought its Victoria Collection, Novero has made the first step for the entire world into a new era where technology offers even more functionality, with a stylish and fashionable touch.